Aquifer’s dynamic courses are delivered through Aqueduct, our proprietary learning management system. 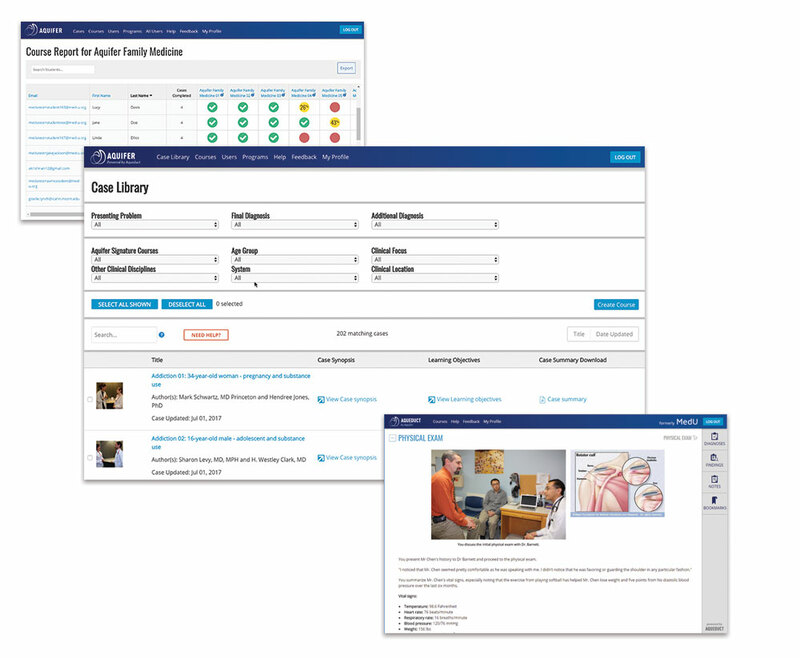 Aqueduct, developed at Aquifer and launched in June 2017, enables administrators and educators to access course content, build custom courses, easily search and discover cases, manage users, and track student progress. Via Aqueduct, Aquifer courses are available on any schedule, at any pace. Students use Aqueduct to complete their case experiences. Our iOS app provides access to cases anytime, anywhere—including working offline. Administrators utilize Aqueduct to view and manage courses within their subscription. And—as an added educational resource—Aquifer subscribers gain access to a range of free interdisciplinary courses, covering key issues in healthcare education, to use on their own or integrate into a custom course. Make the best use of Aquifer’s deep resources: design a completely customized course experience that is specific to your curriculum. The searchable Case Library provides powerful search and filter tools, allowing you to find exactly the cases you need—and discover new content. It’s easy to mix and match cases from courses within your subscription or from our free cross-disciplinary courses to create a custom course that directly corresponds to your curriculum and your course rotations. Building a custom course allows you to organize your users and content and access tailored reporting. With clear and simple reporting—by student, case, course, or program level—Aqueduct provides easy access to student progress through our courses. View student progress and course usage, export reports, and quickly scan students’ summary statements in our easy-to-use reporting dashboard. Aqueduct’s user management tools offer complete control to customize user experiences based on your program’s needs and staffing structure. Decide who has access to work in courses, build student rosters, and view reporting.